ChronoSync 3.3.6 from Econ Technologies is about as full-featured as synchronization programs get. It's easy enough for a novice to use immediately, but has enough geeky options to satisfy the most demanding propellerhead. You begin by selecting the folders or volumes to synchronize, one on the left side of the interface, one on the right. Then you choose a type of synchronization from a pop-up menu. You can copy everything from the left to the right, or vice versa, with any of several approaches; you can also synchronize bidirectionally. There's also a checkbox to determine whether or not the software should synchronize deletions. Click on a button to synchronize the files, and ChronoSync copies them as you've specified. To prevent unintended actions, ChronoSync offers a Trial Synchronization mode that shows you what will happen when you sync, but doesn't copy any files. You can also click on the Analyze button to get a live view of the files in both locations and their status relative to each other. The program gives you a great deal of control over every aspect of file synchronization. You can choose whether to preserve modification dates for folders whose contents have changed; avoid creating empty folder hierarchies; preserve or omit Finder comments; and more. You can also select any of numerous file attributes that, if different between the two sides, will trigger a sync, including Finder flags, access permissions, and locked status-metadata that many syncing programs ignore when comparing files. If your synchronization needs are highly specific, you can use ChronoSync's extensive Rules interface to create patterns for including and/or excluding items. Rules can include any of a vast range of criteria, including the file name, size, Finder label, and nearly any other attribute you can think of. For example, you could look for files that are locked and larger than 50MB, and which were created in the last three days, or those with a Finder label of Red but not the word "book" in the title-all in a single rule. ChronoSync creates a document representing each synchronization setup. If you want to synchronize more than one folder simultaneously, you can create a container that includes multiple sync documents. Each document can run on a schedule, and the ChronoSync application need not be running at sync time; a background process launches and completes the sync, interrupting you only if there's a conflict that requires your attention. Instead of deleting files to make two folders identical, ChronoSync can move extra files into a special archive folder—letting you undo deletions if you later realize you needed one of those files. Similarly, when a given file is different in the two folders being synchronized, ChronoSync can archive the older version rather than simply overwriting it with the newer one. In these respects, ChronoSync acts more like a backup program than a synchronization program, and in many situations it can handle either sort of task with aplomb. ChronoSync's wide range of synchronization options starts with a menu in which you choose the basic type and direction of file copying between two targets. Although ChronoSync preserves most Mac OS X metadata correctly during syncs, it is unable to set ownership correctly for files and folders not owned by the current user; this effectively prevents it from being reliable for synchronizing applications or other files outside your user's folder. (Econ Technologies does offer a limited workaround for this issue, available on request from its tech support department.) According to the developer, the next major release will be able to preserve all file ownership data correctly (and also offer, for the first time, the option to create a bootable duplicate of an entire disk). 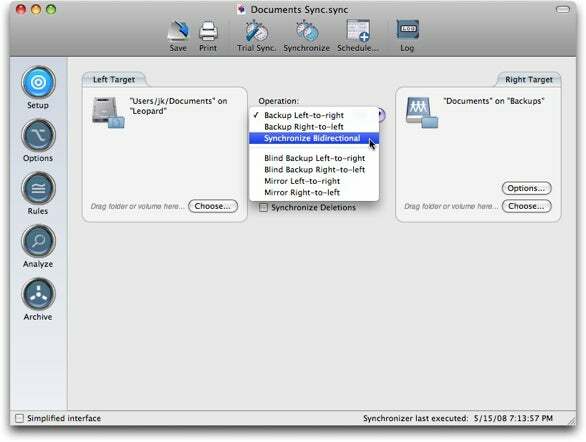 ChronoSync 3.3.6 is impressive as a synchronization program and capable as backup software, too. Although users will have to wait for the next release (a free upgrade for paid customers) to get proper copying of file ownership and bootable duplicates, the current version of ChronoSync can meet virtually any other synchronization need.